Now a normal kid would be thrilled or happy, or at least probably can't be bothered. But guess what happened?! The poor girl was sad. How did I know? It was all over her face, and she told me "Mommy, I'm sad" and of course I asked her why and she said cos there was no class and that the class was "closed" and "empty". Would you believe it?! My two going on to three-years old actually felt sad that there was no class. For that moment, despite all the usual tantrums that she throws and that I clearly know of, she seemed like the most perfect child ever! I know I sound bias but seriously it's quite surprising that she actually felt sad. So all along the way from where class was to the time we were on the train and reached town, Kaitlin would tell me that she was sad and disappointingly ask me why there is no class. I did feel quite sad that the babygirl was feeling down and all I could do was explain why there was no class, and to cheer her up by telling her that we could go for class next week and that I was now going to bring her to have some fun. I decided to try and cheer the girl up by bringing her to the museum (will blog about this soon!) 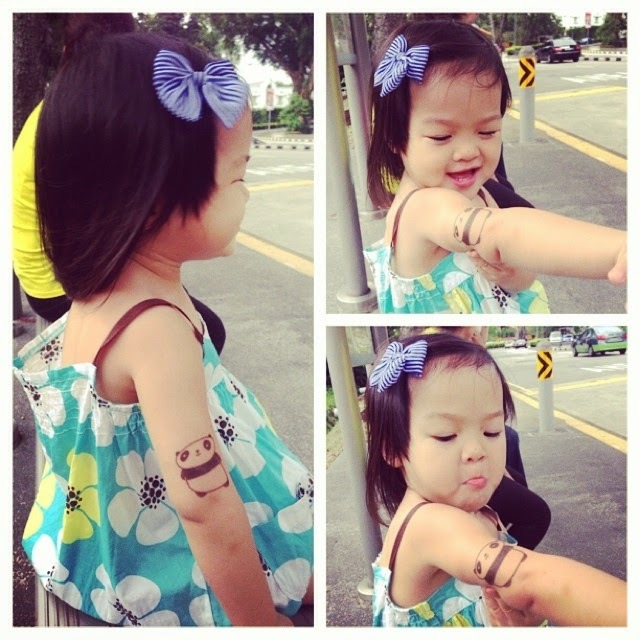 but we were waiting for Daddy Li so we went to check out the shops first..that was when I saw the temporary tattoo and thought why not! Hopefully it would distract her and cheer her up. Honestly, the panda was the only cute and nice one so it wasn't a difficult choice. I had wanted to get one for myself too so we could both have tattoos but there weren't any ones that I liked so we paid for it and left to the loo. Yes. I brought Kaitlin to the loo to put on her tattoo. I was afraid she might freak out or start wailing while I'm putting it on for her or after it was done so I prepped and explained to her first and checked with her if she did want it. I decided to put it on her arm! 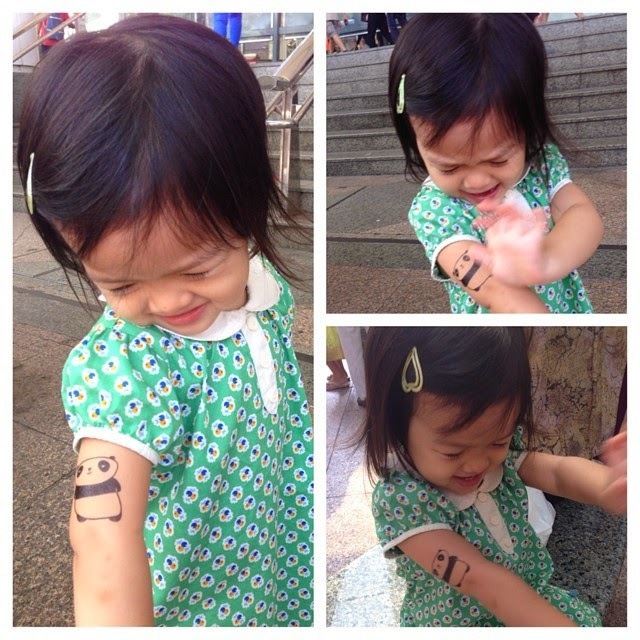 Just like the one Daddy Li has so they can have matching arm tattoos. Well as you can see..she was pretty happy about it! 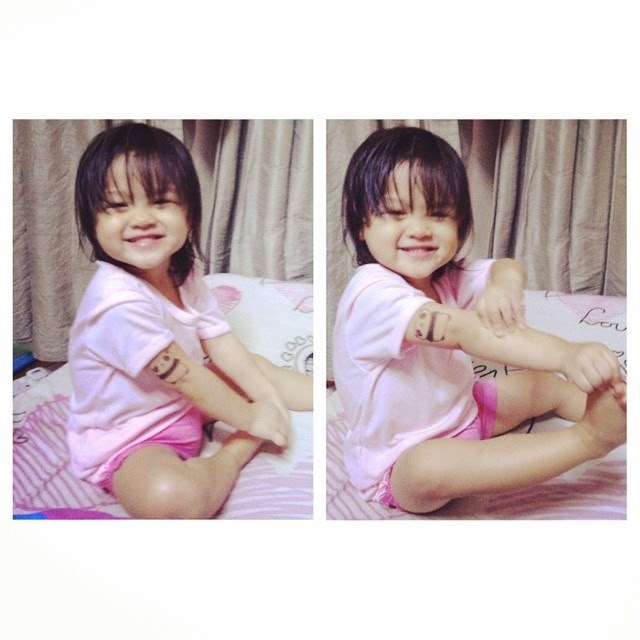 The above picture was shortly after I put the tattoo on her and she is saying 'Hi' to her panda. I told her to try and not be sad already and that she has panda, me and Daddy to spend the rest of the day with. Well..what happened next was awhile later..out of nowhere, she said "Mommy, I'm not sad already". I told her that was great and asked her why and if it was because of the panda tattoo and she said yes! Seems like the panda played a big role in cheering babygirl up. Again, I'm sounding bias here but I thought Kaitlin was pretty darn cool and badass with her tattoo. I saw a couple of adults glancing at her tattoo and giving the "did this mom do a real tattoo on her daughter" look on their face..and let's just say who needs colorful glittery tattoos?! Black and white is just as awesome! That evening we asked Kaitlin if she wanted to remove it but she didn't want to so we left it on her. The below photo was her with her tattoo a few days later. If you are wondering..yes the panda is still on her but it is fading! I'm going to be removing it for her cos I think it's not such a good idea to leave it on her for too long and she seems pretty okay with parting with panda. In any case, Mommy over here has already taken lots of pictures for memory sake, so if she misses panda she can look at the photos.